Swimming is life skill that every child should learn as early as possible. While you can teach your own child how to swim, many parents find it easier to enrol them in swimming lessons instead. 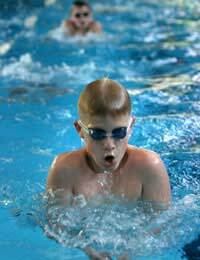 An intensive summer course is often a good way to help them become better swimmers, and can also help them to jump a level or two when their term-time lessons resume. If your local leisure centre does not offer swimming classes or is already booked throughout the summer, ask around at local private gyms to see what is on offer. Schools with swimming pool facilities often offer lessons during the summer as well. It might be a good idea to enrol your child with a friend, especially if he or she is a little bit older and has not taken lessons before. Parents of very young children might also consider taking a baby dolphin course with their baby over the summer. Ask if your local swimming baths offer classes for parents and babies, or special mother and baby sessions. They can be great fun for the both of you! Some children can't live without a football. If your son – or daughter – fits into this category, enrolling him or her in summertime football lessons, or even a football camp, could save both their sanity and yours. Many schools offer summer football programmes with trained coaches who seek to improve not only their football skills but their health, fitness and coordination in general. Community football programmes also work to get children off the streets and do something worthwhile instead. Some professional football clubs also offer football training to children. If your child is serious about the sport, this might be a good investment. Little girls often beg their mummies to allow them to take dance classes from an early age, as they are enthralled by pink tutus and gorgeous dancing shoes. But dancing is a skill that both boys and girls can benefit from regardless of the outfit – it teaches balance, coordination, flexibility and physical prowess – as well as how to concentrate and listen well to directions. Flamenco. Spanish dance characterised by special footwork. Salsa. These dance styles have their roots in Cuba and the Caribbean in general. Tap. Made popular in the United States, this dance requires special shoes which have small metal plates inserted to make specific sounds. Balinese Dance. Movement is coordinated to the rhythm or traditional instruments. Children traditionally start learning dance from their mothers at age four. Hula Dancing. A dance native to Hawaii that uses traditional hand and hip movements for effect. Jazz. Emphasises the dancer's own original style in response to jazz music. Enrolling your child in a fun and educational class that also teaches them physical skills is a great way to encourage both learning and physical activity. So keep them fit and healthy this summer by finding a class that's right for them!